Have you heard of the book, Heaven is for Real? It took all of the top book lists by storm over the last few years. It's the true story of a four-year-old boy who had emergency surgery and journeyed to heaven and back while he was on the operating table. The book is what he told his dad he saw while he was in heaven. I haven't read the original Heaven is for Real, but Tommy Nelson sent me Heaven is for Real for Little Ones this month as my June resource. As soon as it came in the mail, we all sat down to read it, and I was curious to see how they would handle a near death experience in a children's book. The board book doesn't actually touch on Colton's story at all. Instead, it is simplified description of what he saw in heaven without going into the operation/traumatic experience that he and his family went through. It is a beautiful way to introduce the concept of heaven to little ones while explaining how much Jesus really truly loves them! Heaven is for Real for Little Ones, is a book with sweet illustrations depicting children running, playing, and exploring heaven with Jesus. I really loved how it talks about the beauty of heaven and all the wonderful things that we will get to do and experience there without any pain or tears. In fact, this little board book reminded me about how much I'm looking forward to one day being there myself! Heaven is for Real for Little Ones retails for $7.99 and is available through Tommy Nelson and other major book retailers. If you'd like a peak inside the cover, feel free to click HERE. 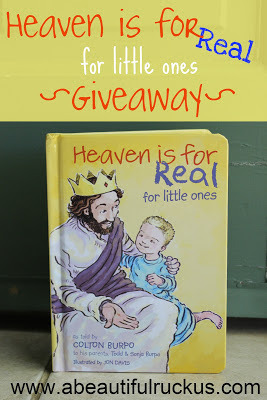 Tommy Nelson is giving one A Beautiful Ruckus reader a copy of Heaven is for Real for Little Ones. To enter the giveaway, please use the Rafflecopter widget below to enter. The first two tasks are not optional and must be completed to qualify for this giveaway. If you choose the "anonymous option" to comment, please at least include your first name and first letter of your last name. It's impossible to verify comment entries without names! The additional entry tasks are optional. Winning entries will be validated prior to announcing the winner with an alternate drawn if the entries cannot be verified. The contest ends at 11:59pm on Monday, June 17th. The winner(s) will be randomly chosen and contacted by email on Tuesday, June 18th. The winner(s) will have 48 hours to respond to the email with their information so that the prize can be forwarded to them. A Beautiful Ruckus is not responsible for the delivery of the prize and is not responsible if the sponsor does not deliver. This giveaway is open to residents of the United States. A Beautiful Ruckus received complimentary item(s) for review in exchange for hosting this giveaway from Tommy Nelson. This post may contain affiliate links. For more info, please see my disclaimer page. I haven't talked to my sons about heaven yet...we sing Jesus Loves Me and read Bible stories but I would love this book so that we can both read about heaven. Yes I have!! Thanks for the book idea! My child is too young for this conversation yet, but I think the book looks like a great idea! We read lots of bibe stories but no specifically heaven yet. My 4 year old Grandson questions me about heaven because we lost my boyfriend recently & suddenly who was a Grandpa to him. I had a hard time explaining heaven to him since he took me off guard. This book sounds amazing and would give him a better understanding of what I was trying to get across to him. I loved the book its a must read!! Yes, we have talked to our 4 yr old about heaven. He asked questions after his dog (Ivy) had to be put to sleep and also around Christmas. He asked is Ivy in heaven and that he missed her and then asked is that where Jesus is, why is he there? He told him yes that is where Jesus is and that he was needed in heaven to help take care of everyone. He has been going to church since he was 1 1/2 and into a class room for his age and the talk about Jesus, etc. No, they are too young. Mine are 3 so they think Heaven is a group of angels flying around in the clouds. Isabelle loves all sorts a Bible stories. I think this would be a great addition to our collection!